What are my options for straight teeth quickly? With such busy and hectic lives we know how things can often be overlooked, perhaps you are getting married and have just realised you’re not happy with your smile? Perhaps you have a big birthday or other celebration coming up and have suddenly realised you need to look good for the photos? Depending upon how long you have got there are a few options available to get fast results, let’s take a look. If you have just a single tooth which is mildly rotated or twisted or perhaps even a couple of front teeth then this can often be corrected with dental bonding. Dental bonding is where your dentist as a small amount of tooth coloured composite material to the visible part of your tooth, this material can be built up to make your teeth look straight. How quickly can I have straight teeth with dental bonding? The process is done with you sitting in the dental chair and can take anywhere from 45 min up to a few hours, depending upon the number of teeth you want straight. For fast results, dental bonding certainly beats every other form of straight teeth treatment but it is only suitable for correcting very mildly crooked teeth. If you have moderately crooked teeth, in other words, a few teeth which are quite crooked or many crooked teeth then dental bonding is a possibility as are veneers and orthodontics. Dental veneers work on the same principle as bonding, they cover the surface of your tooth, leaving your natural tooth where it is and simply building out areas of your tooth to make it look straight. Dental veneers are more permanent than dental bonding and will last longer. A big advantage with dental veneers is that you are able to have instant straight white teeth as the veneers can be made any colour and as white as you like. Moderately crooked teeth can also be straightened quickly using Invisalign Go. This is a clear removable brace which moves teeth rapidly compared to other orthodontic systems. The Inman aligner is also a system able to straighten moderately crooked teeth rapidly. The Inman aligner works by simultaneously pushing and pulling teeth on different parts using a revolutionary new spring system. How quickly can I have straight teeth with Inman aligner? Typical treatment times are between 12 and 16 weeks, assuming you only have moderately crooked front teeth. How quickly can I have straight teeth with Invisalign Go? Typical treatment times range from approximately 4 to 7 months, assuming you only want the front teeth straightened. How quickly can I have straight teeth with dental veneers? From start to finish we recommend allowing at least four weeks. This will give you time to have a consultation with the dentist, have some initial diagnostics done to work out the final shape of your teeth and then have the teeth prepared by the dentist and veneers made by the technician. Severely crooked teeth will almost certainly require extended treatment with orthodontics. Whilst bonding and veneers are excellent at straightening rotated teeth, if the body of the tooth is not in the correct position then orthodontics will most likely be the best option. There are orthodontic systems to give fast results however these generally only work on the top or bottom front teeth. If you need other teeth to be moved as well then more complex orthodontics maybe your best option. Orthodontic systems such as Invisalign and Six Month Smiles are ideal options to straighten more severely crooked teeth. How quickly can I have straight teeth with Invisalign? Typical treatments with Invisalign take between 12 and 24 months, depending upon the severity of your crooked teeth. 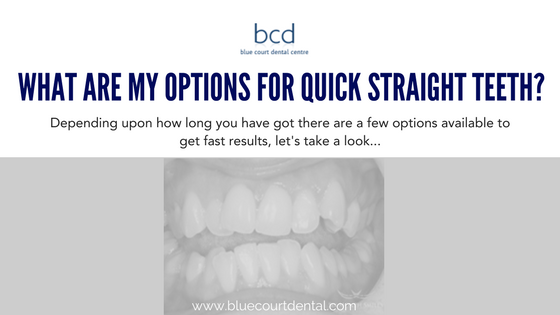 There’s no one size fits all solution to having straight teeth quickly, it depends upon your clinical situation and budget, the best way to find out which technique is best for you is to visit your dentist for an initial consultation. This entry was posted in Orthodontics and tagged Dental bonding, dental veneers, Fast straight teeth, Inman Aligner, Invisalign, Quick straight teeth, Rapid straight teeth on 4 January 2018 by Dr Nishan Dixit.